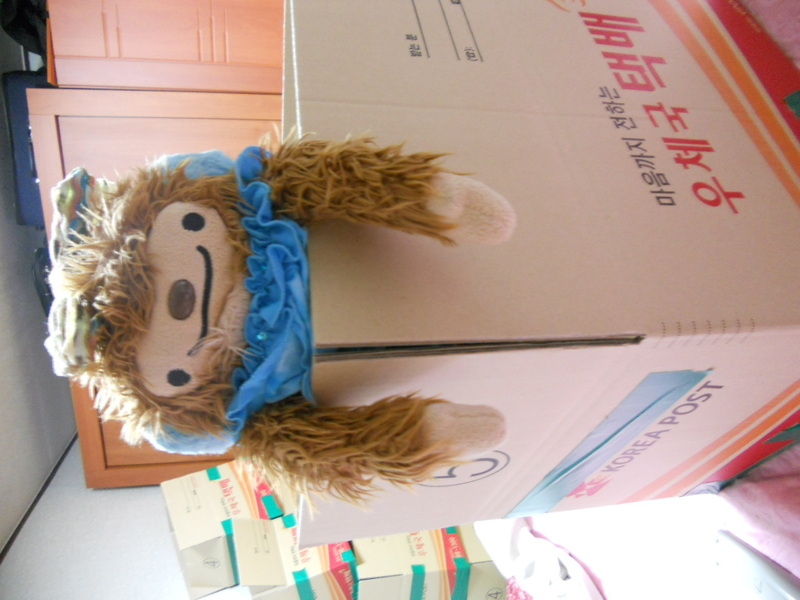 Last bit of packing…..28 boxes!!! The final fab four helped to pack and took a break. Quatchella waiting for the kind post office van to pick up the boxes. All her brothers were exhausted and opted not to tag along. 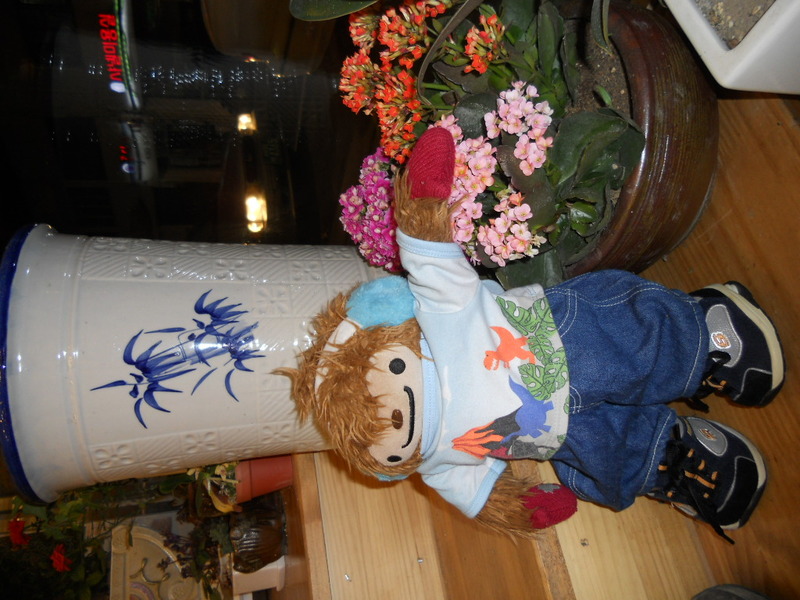 Here is Quatchella thanking the post office staff with a big chocolate cake from Mozart bakery. 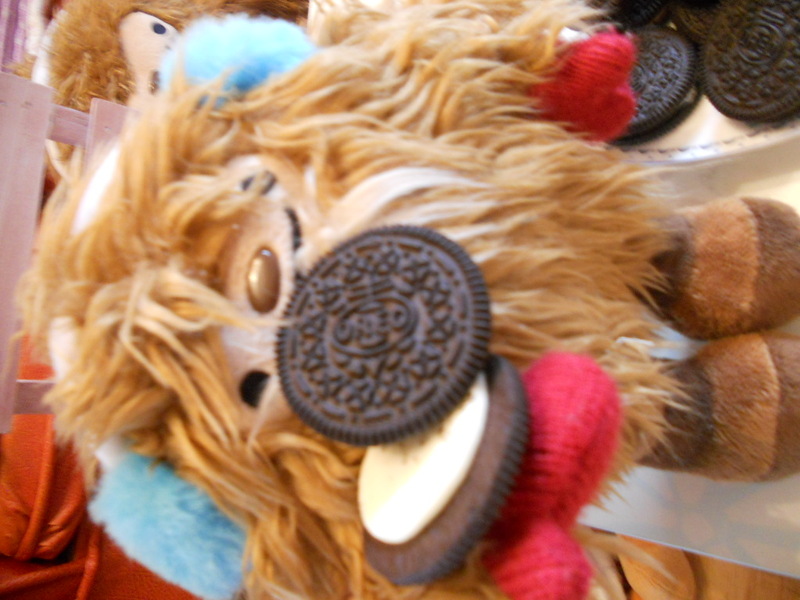 As you know, Quatchis’ LOVE, LOVE COOKIES!!!!! 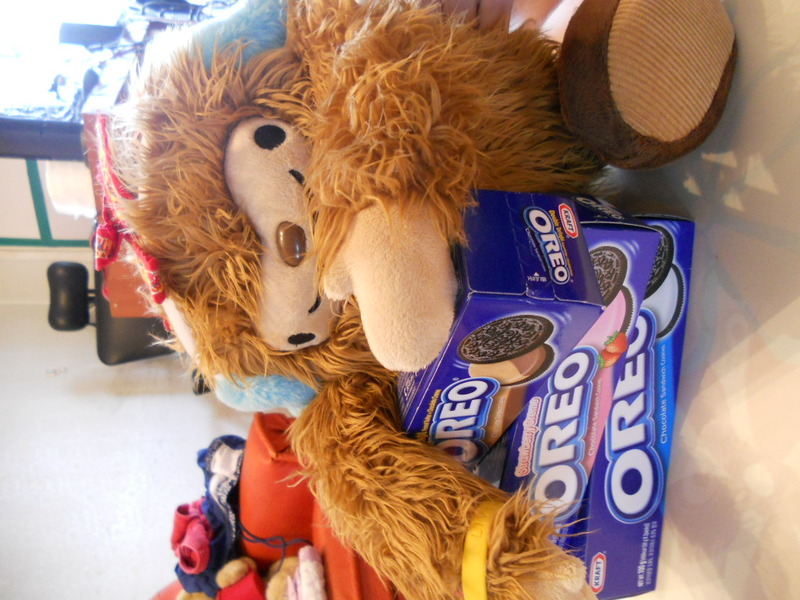 Quatchette went shopping and found OREOS!!! She usually like the classic white filling but she couldn’t resist trying the peanut butter/chocolate combo and the strawberry creme one. First bunch of cookies go to the little ones. After all, they are the smallest. 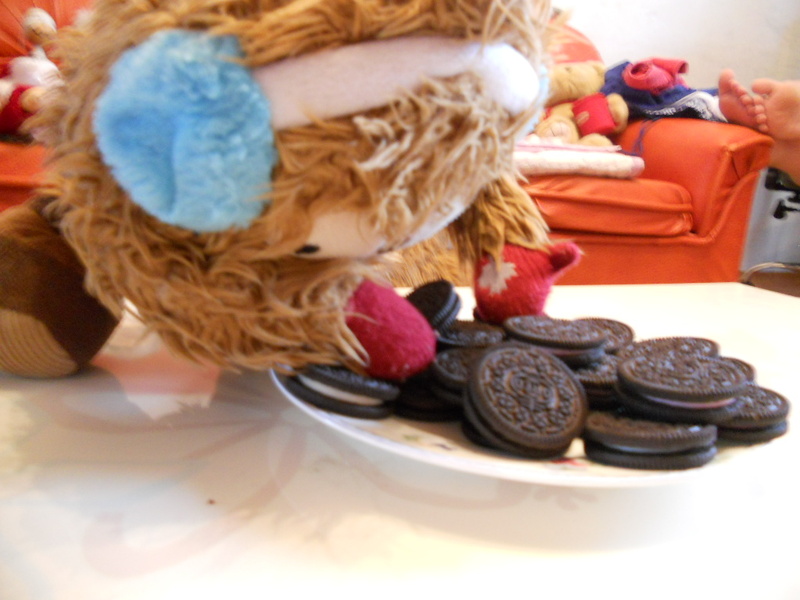 Quatchiano is eating the oreos the old fashioned way. 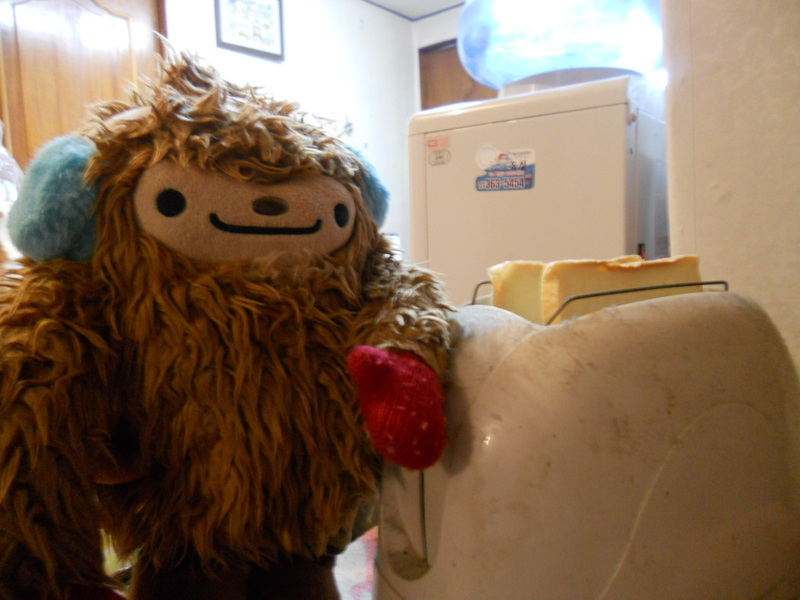 Quatchimo is seeing nothing but cookies! 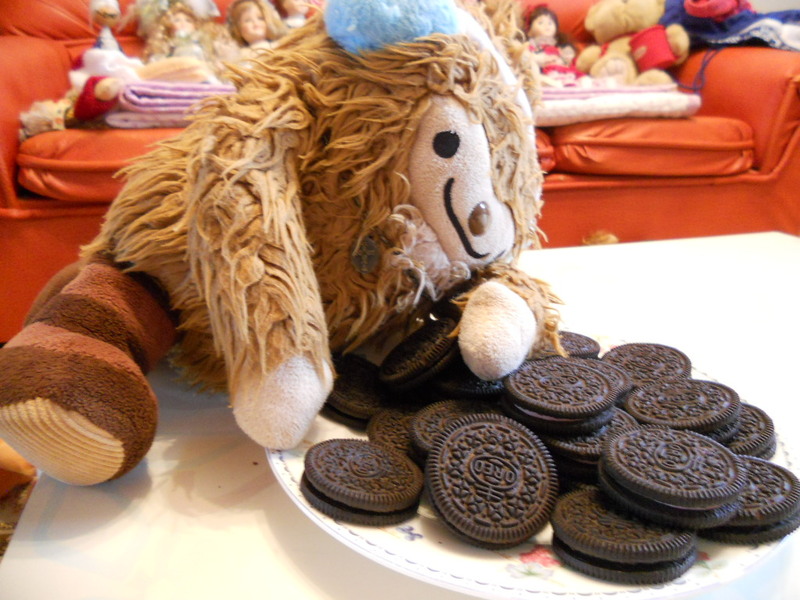 Quatchkin is counting his cookie treasure. 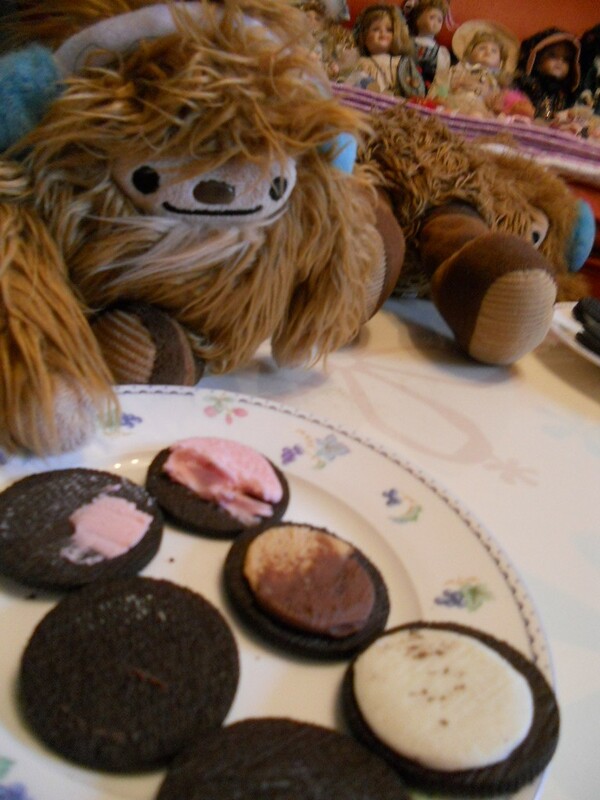 Quatchford is thinking about which oreo to try first. 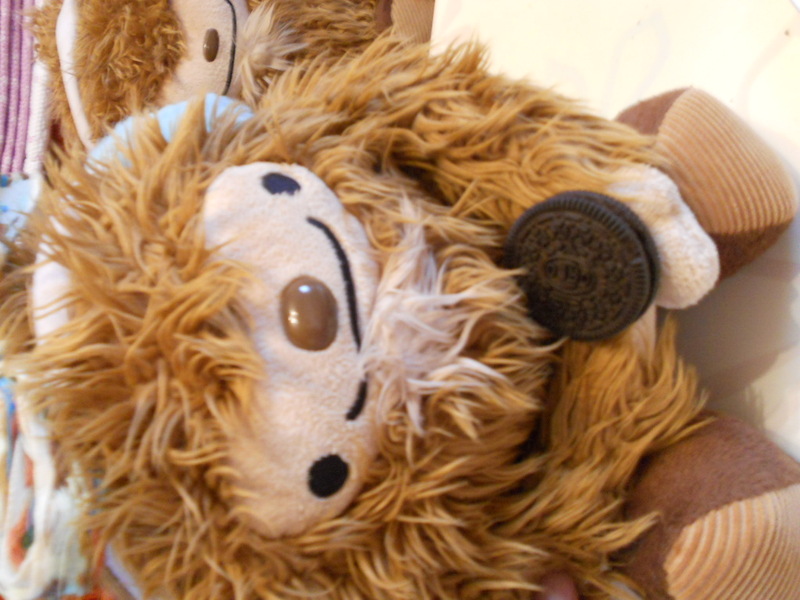 Ralph munched on his oreo so fast, it is almost all gone. 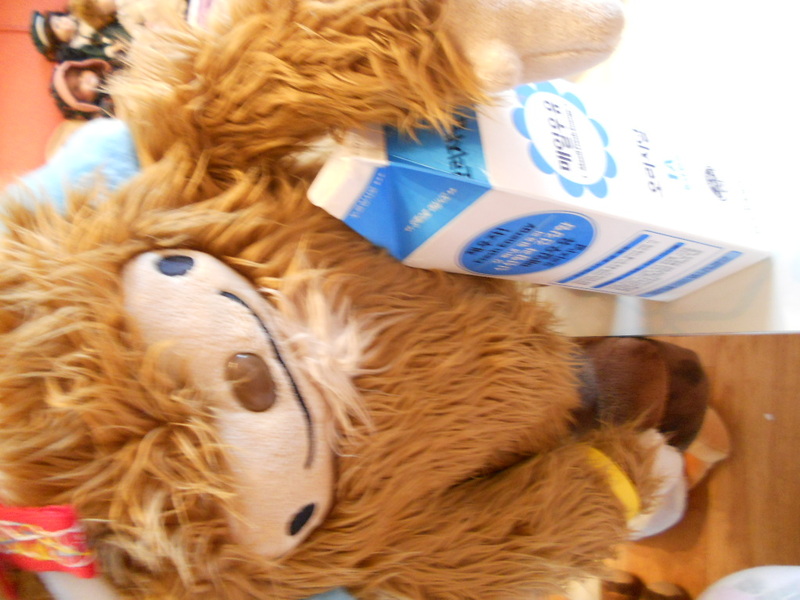 Quatchman wants to slowly enjoy his. 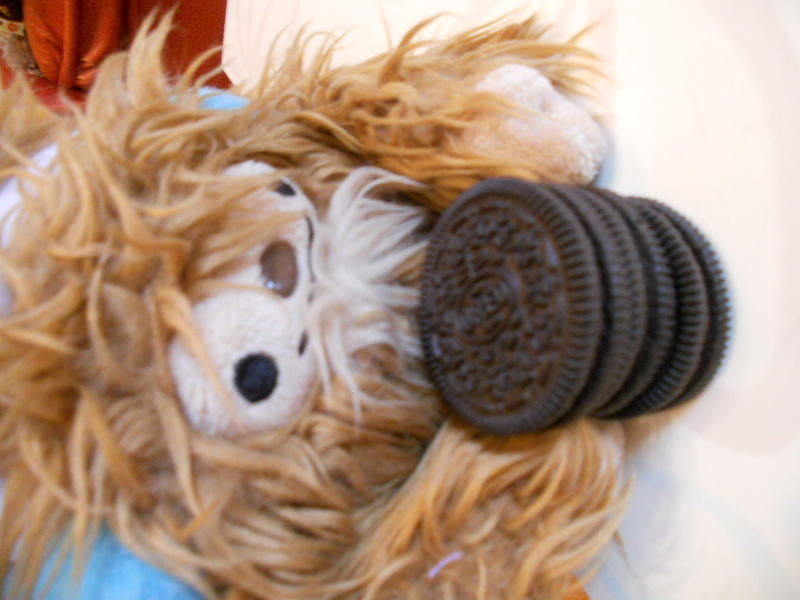 He just wants to enjoy the smell and the feel of the oreo now. 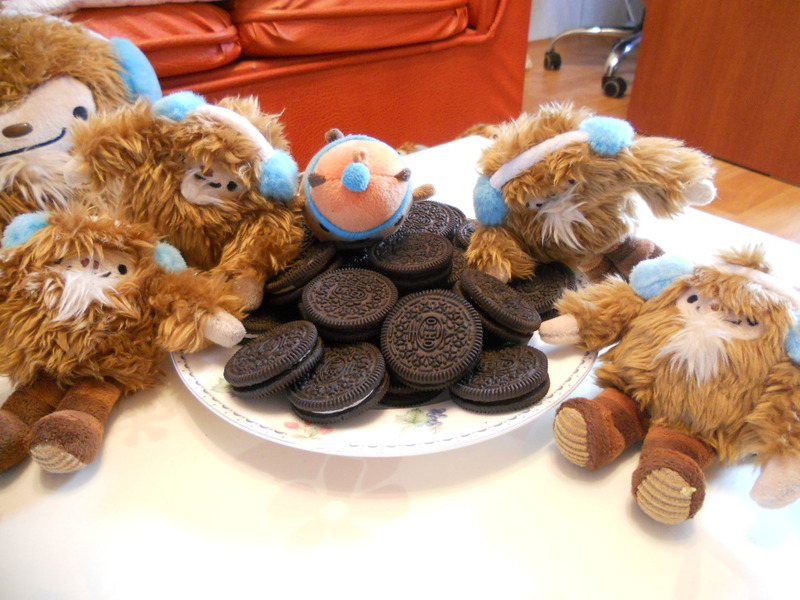 Quatchone is picking the best oreo. He can’t believe that Quatchette got them!! 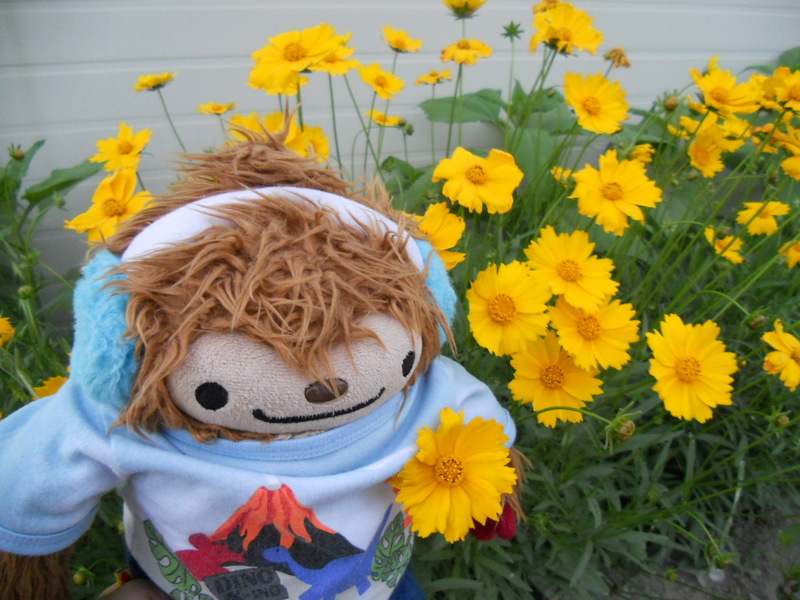 Quatchi thinks they are the most beautiful thing in the world. 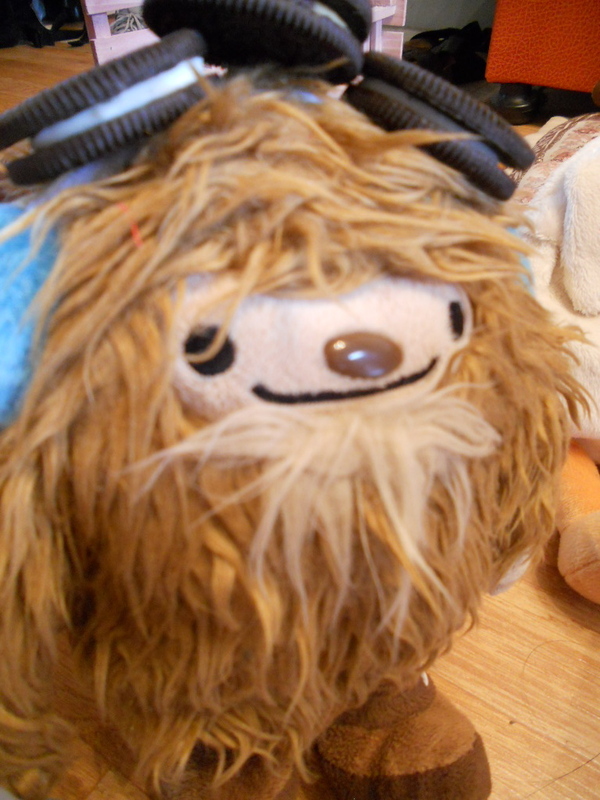 Quatchster is giving one to Quatchella. How could something so small be so yummy!!! “Oops! 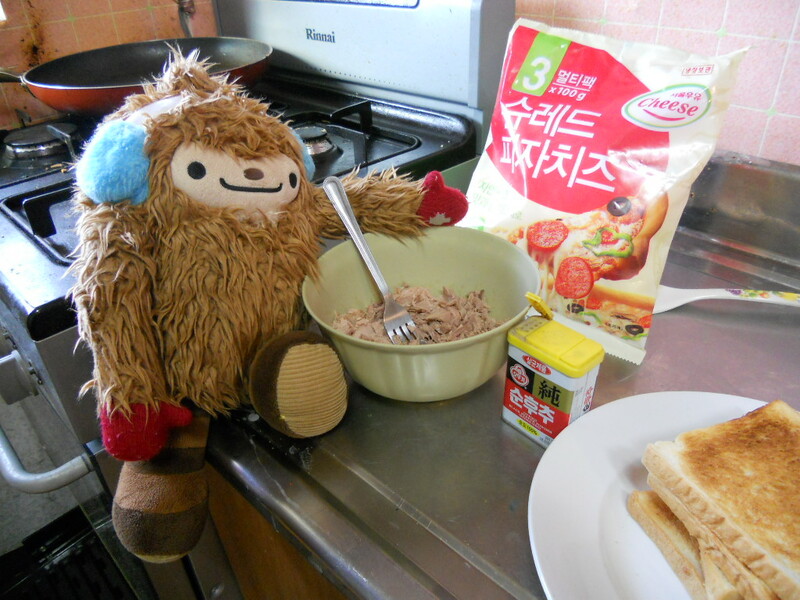 I almost forgot the milk!” Quatchette says. “I don’t think they care!” Hercules laughs. 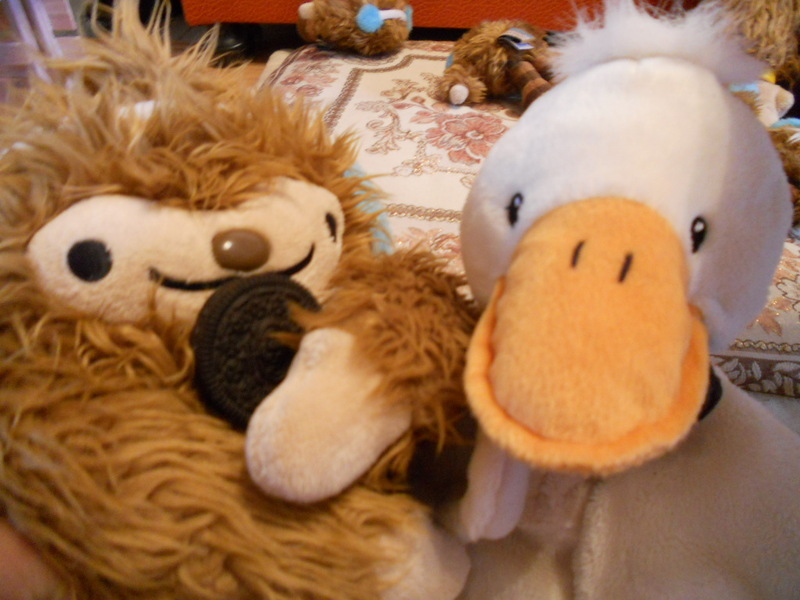 “Wow that was wonderful!” Hercules says to Quatchette. “Thank you Quatchette!” everyone says even in the midst of a cookie coma. What is your favorite oreo flavor? Seems like the cooking bug is travelling around. 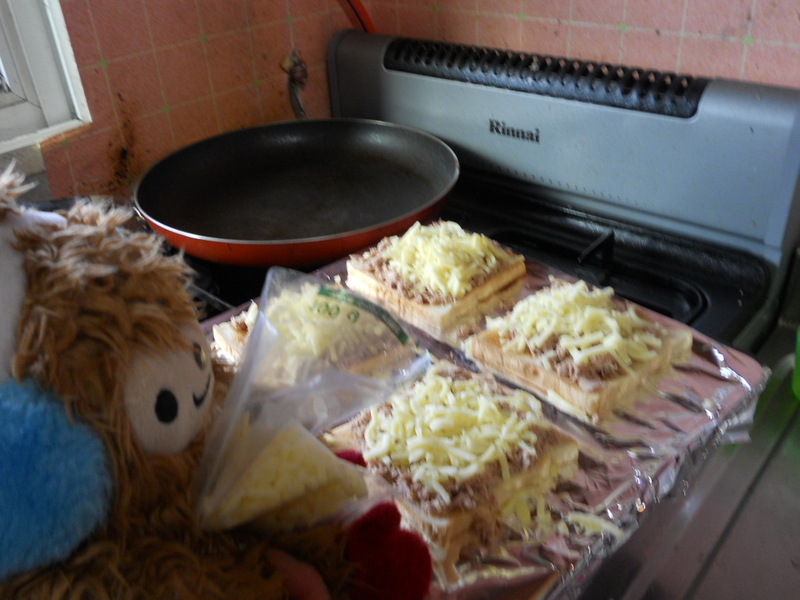 Quatchster decided to make tuna melts for everyone. Oops! A little bit too long in the oven. Sophia and her husband tried some. Yummy! 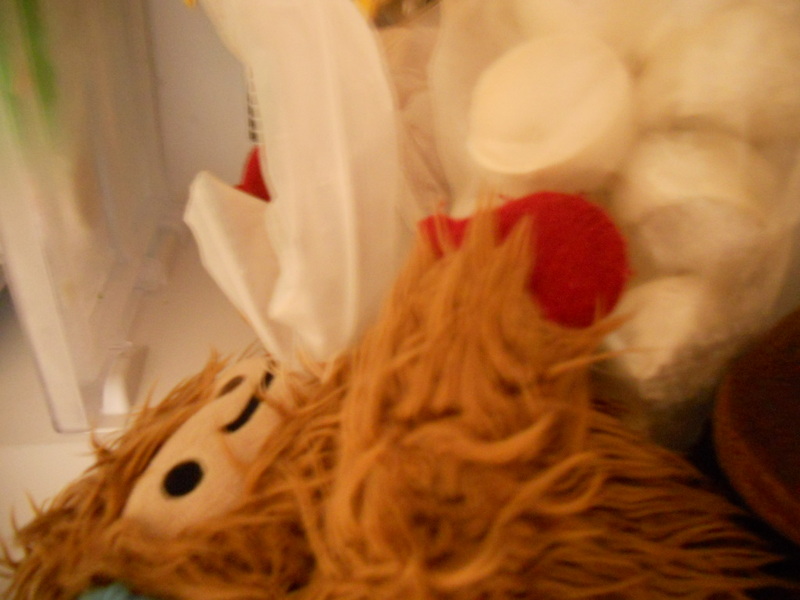 Quatchster says, that he has to make a few more batches for the rest of the Quatchi family members so, he will make sure he is off the computer this time. LOL. 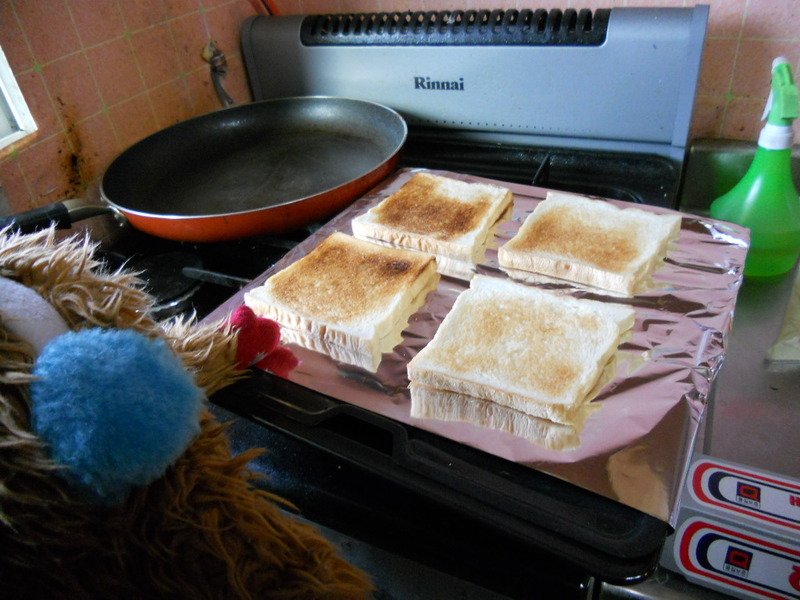 Quatchone’s turn to cook for the family. 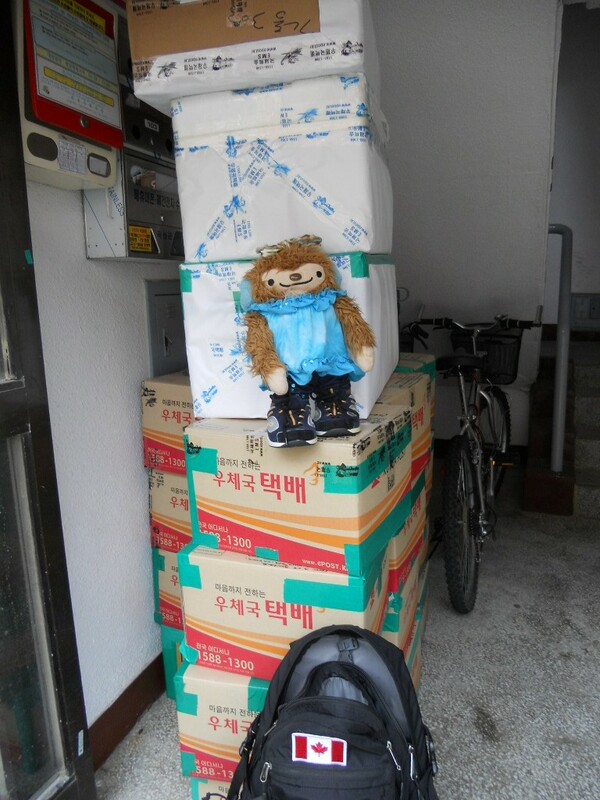 He is going to make mandu for everyone. Mandu is a Korean meat dumpling with pork, veggies, an vermencelli wrapped in a wonton like peel. 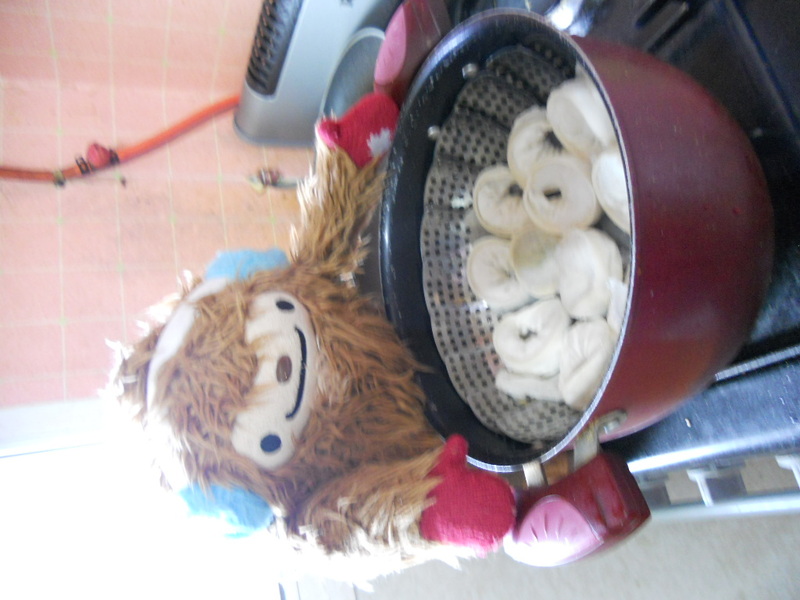 They usually come frozen and need to be steamed for only 20 minutes. 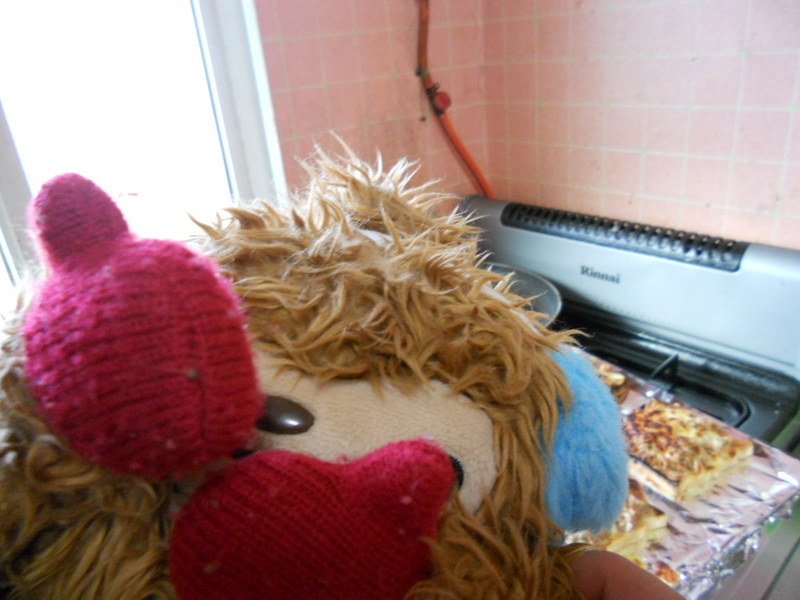 Getting the steamer ready. 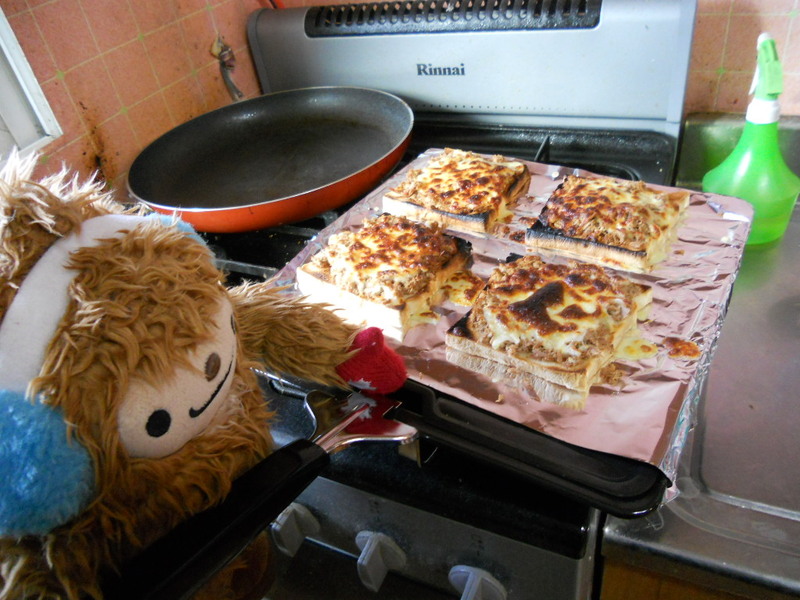 Quatchone’s secret trick is to use the cheese cloth or linen cloth to line the steamer. It keeps the mandu from sticking to the metal and makes it easier to keep the mandu whole as well as make it easier for cleaning. This is only the first batch for everyone. 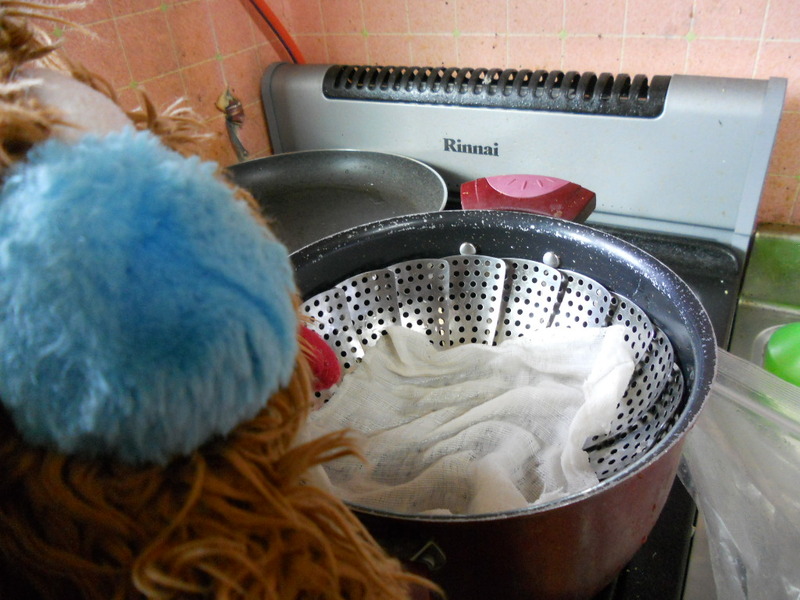 There is only so much that Quatchone can stick into the pot. 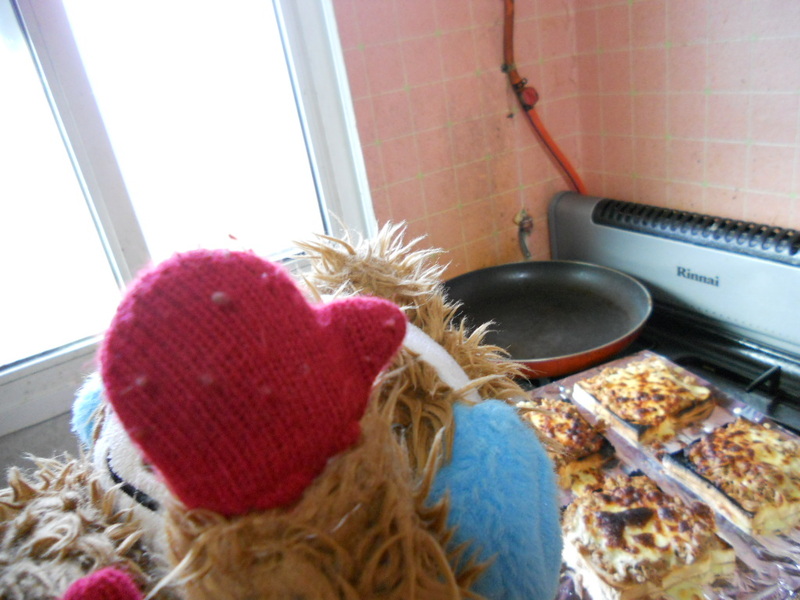 While that is steaming Quatchone is getting the sauce ready. 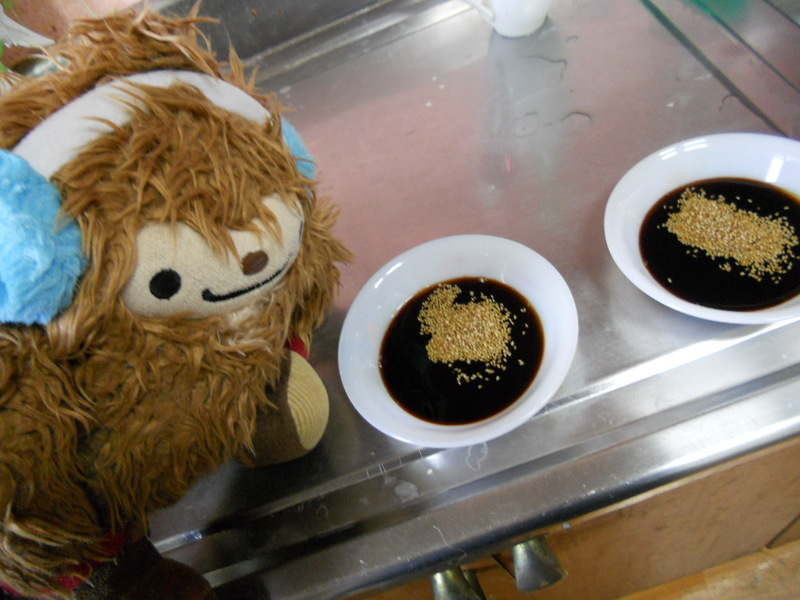 It is simple, soy sauce, sesame oil, and some sesame seeds. If he had some dobanchang he would add it to one of them. 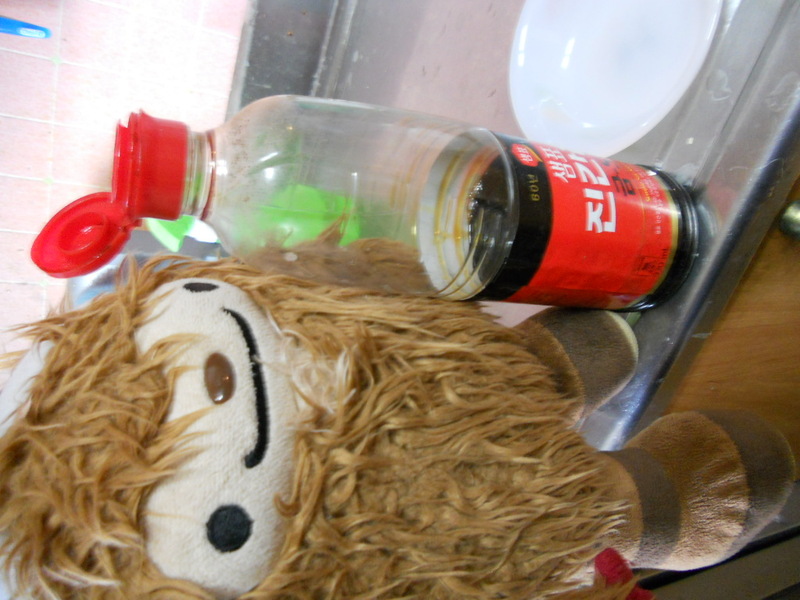 He likes spicy food, but not all of the Quatchis’ can take it. Here is the first batch! Yummy! Good job! Since Sophia is overseas with her husband teaching english at a public elementary school in South Korea, she isn’t able to wish her sister, Lucy, “Happy Birthday!” in person. 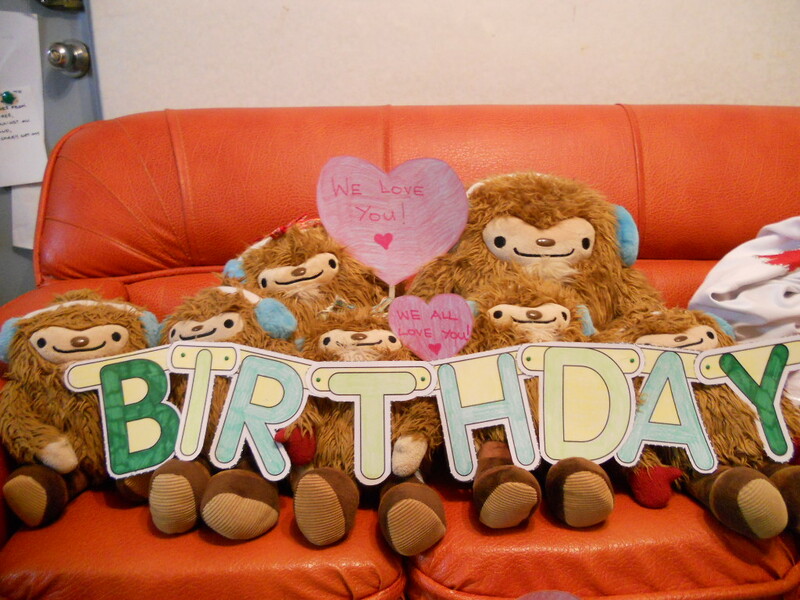 The Quatchi family decided to help and make the decorations with Sophia and wish her sister (their Aunt) a Quatchi style Happy birthday. 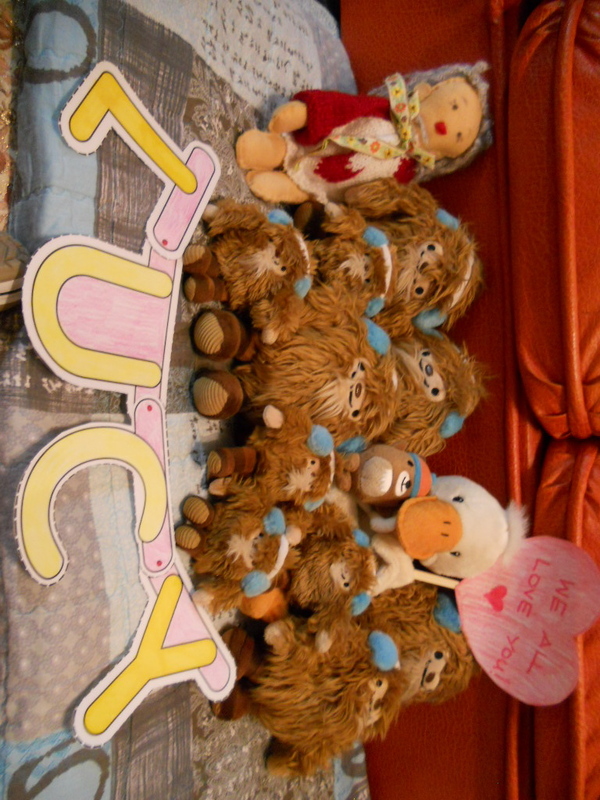 You are the best and we can’t wait to see you in Vancouver BC Canada. May all your wishes come true today and every day after. 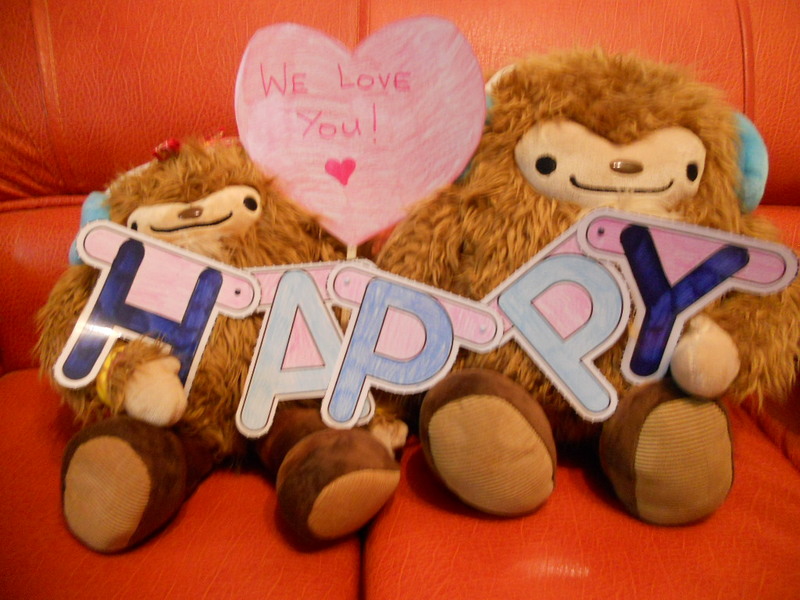 Big hugs, big smiles, and lots of love, your sister, your brother-in-law, and the Quatchi family. 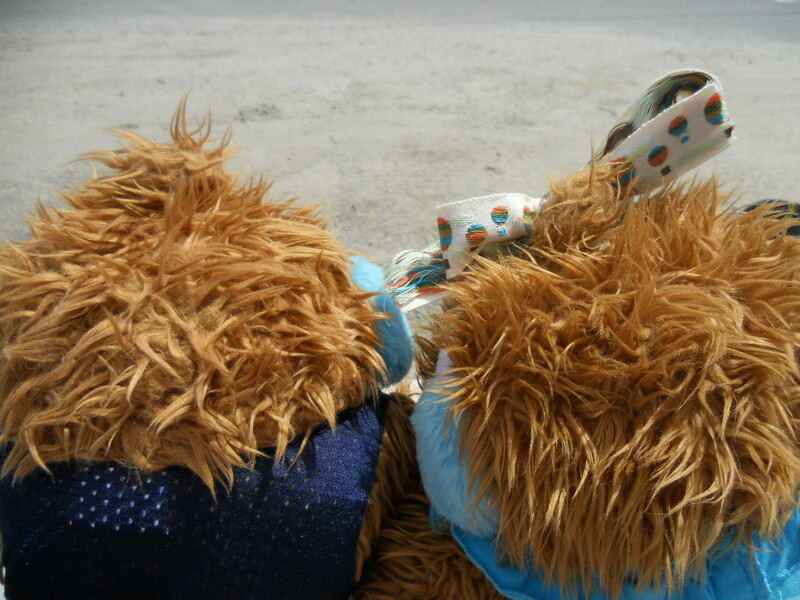 Quatchella and Quatchster decided to check out the sunshine for bit, since the weather cooled down a little. 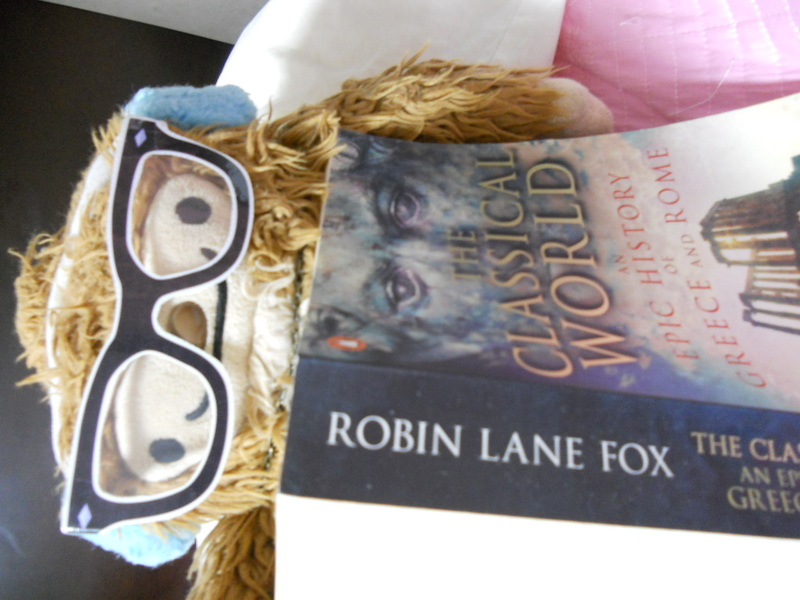 I think that Quatchster has the right idea. This is the pace that Quatchone thinks the town runs on. LOL. Looks like the sun is beginning to set. Isn’t it the most beautiful thing that you have ever seen? 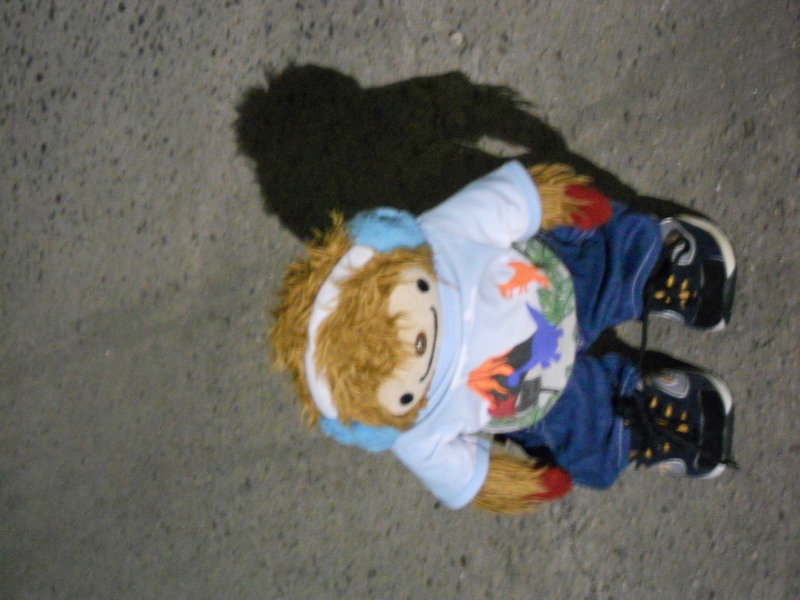 Quatchone isn’t afraid of his shadow! He just wishes that it was bigger. LOL. Got to get in a climb somewhere. Sophia thinks this is a.sign for you to park your bike or car. 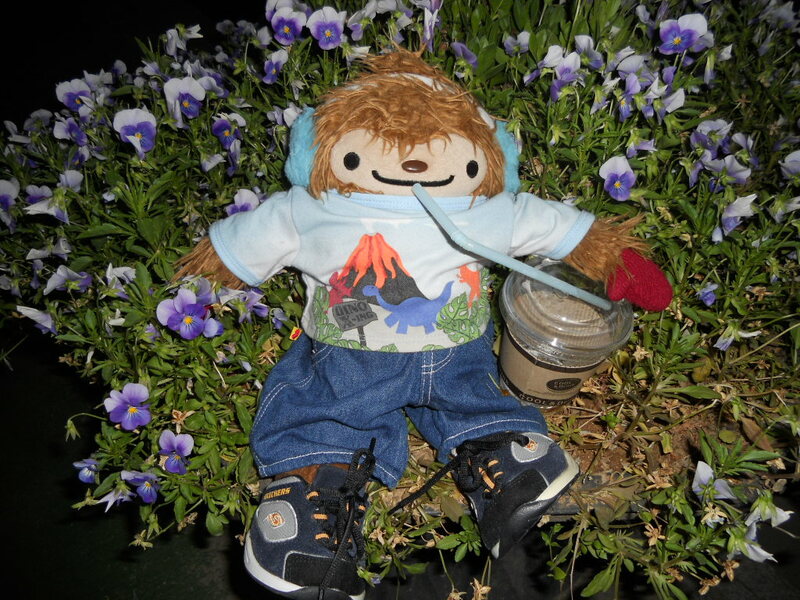 Quatchone really enjoys the flowers his own way and having iced coffee at the same time is pretty sweet. 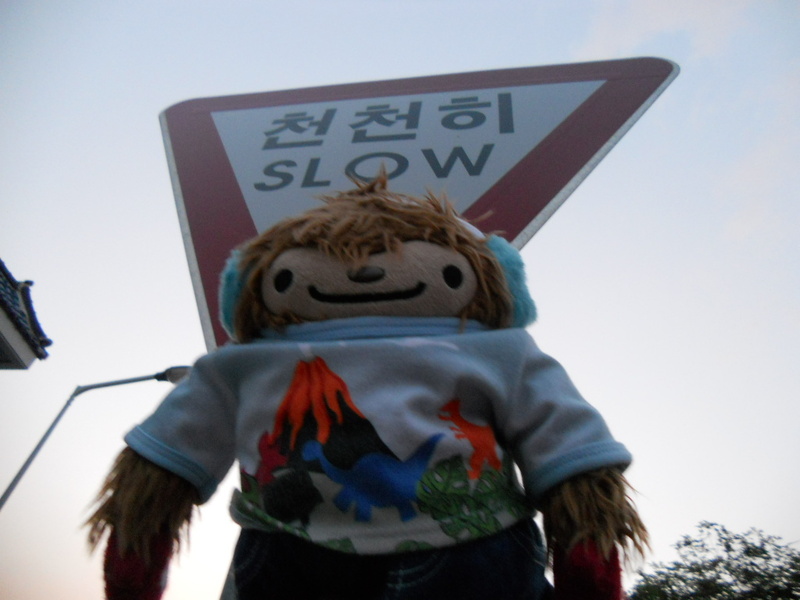 Here is the sign that represents Gokseong. 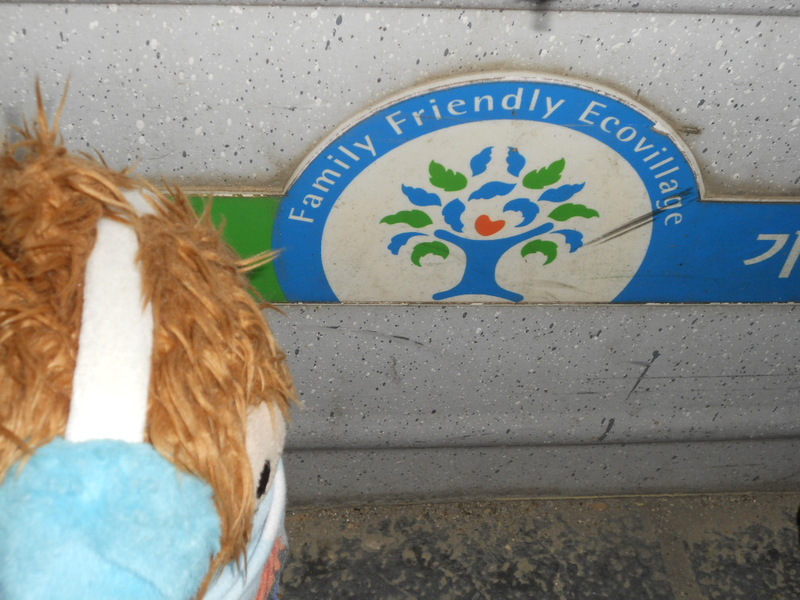 It is the eco friendly village. Not sure what that exactly refers to, but…..
Quatchone waiting for Sophia and her husband to finish buying their baked goods. One last flower shot. Did you know that it is only 8:00 pm here? Isn’t it dark? 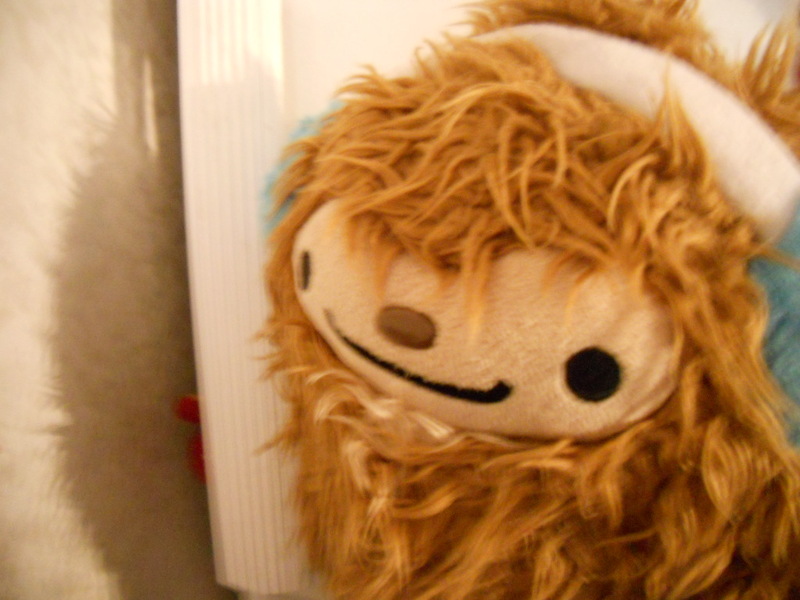 Quatchone loves it because he can see the stars now. 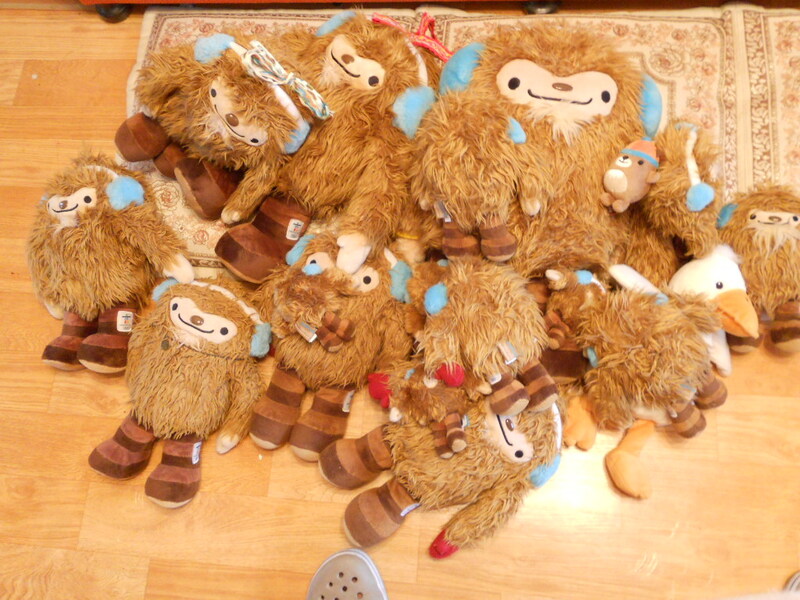 Sorry, the weather was so muggy and gross that the Quatchis’ celebrated at home with the air conditioner. LOL. They did not feel up to taking pics. But they did remember enjoy the day! They watched “One Week” the movie because it is about a man who finds out that he has cancer and ends up going across Canada on his motorcycle and discovers both the beauty in Canada and himself. 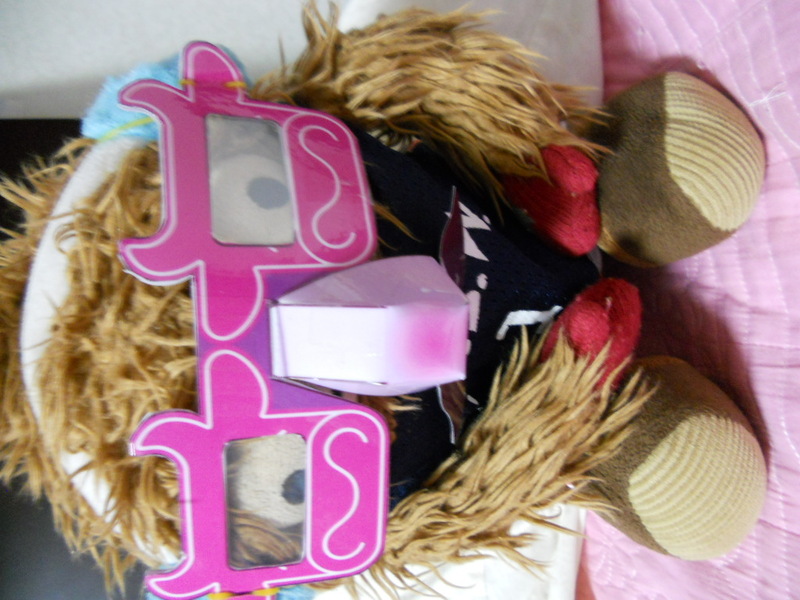 It is really cool! 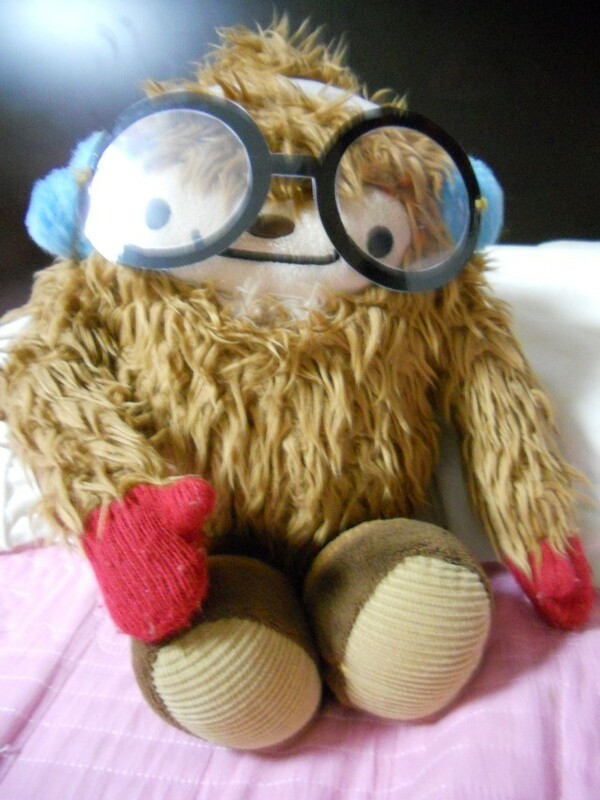 One day the Quatchi family and I and my husband want to do that but in a RV. If you get a chance watch it. It has tons of great Canadian references! Finally, the weather let up a bit. 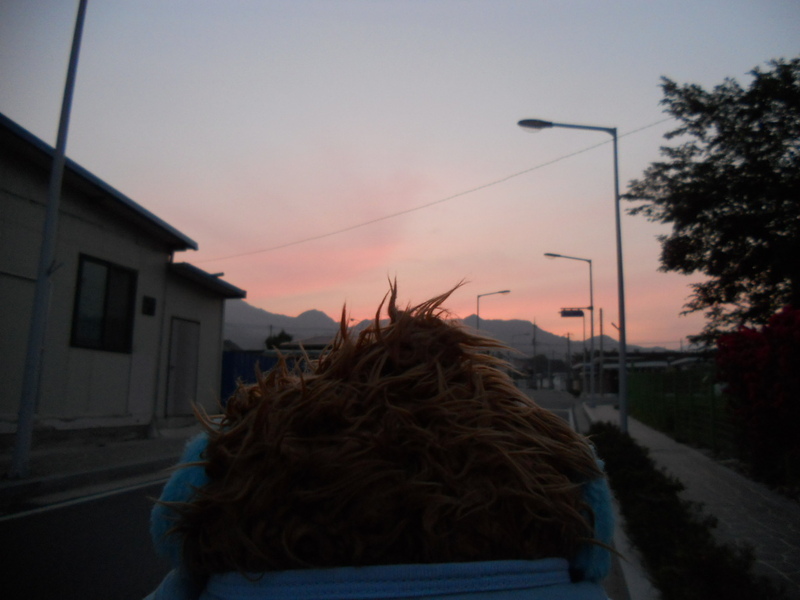 It is usually cooler in the late afternoon so Quatchone decided to come with us for a walk. 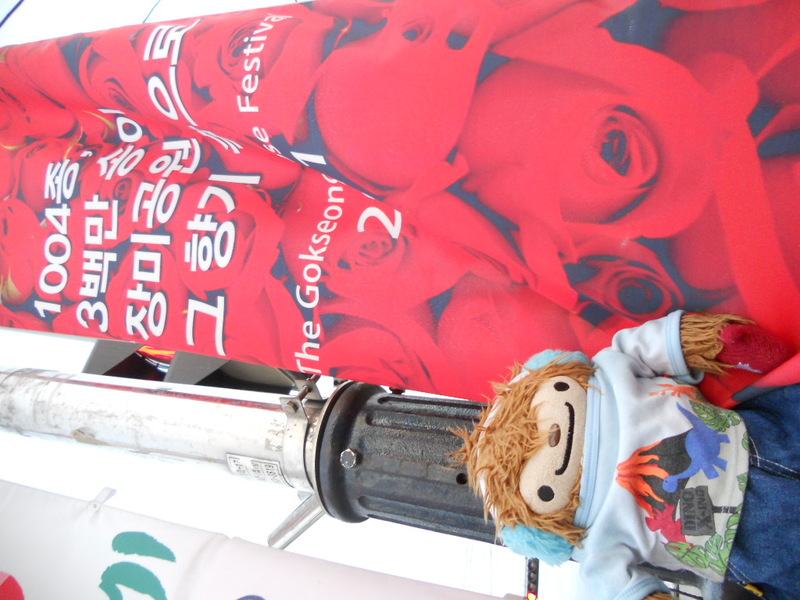 Here he is posing with a banner of the Rose festival. 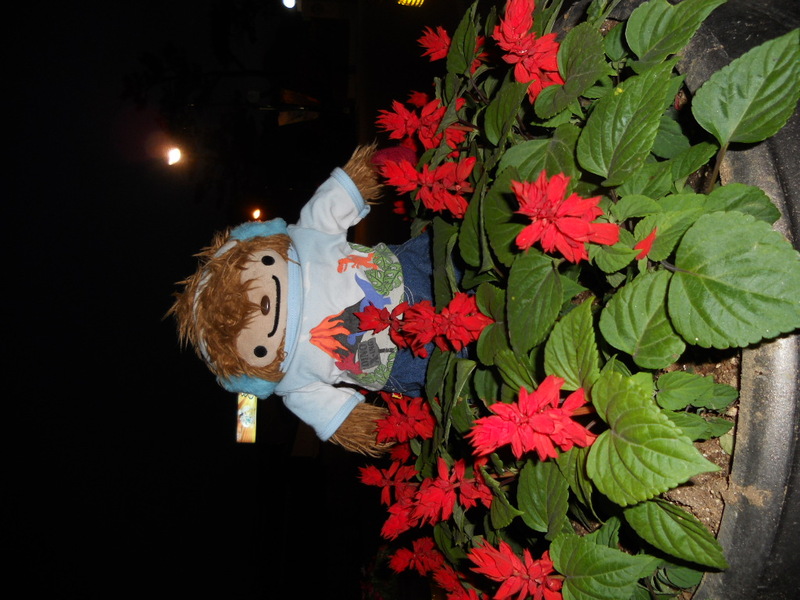 It has 300 kinds of different roses in all sorts of colors. It is also free to go and see. 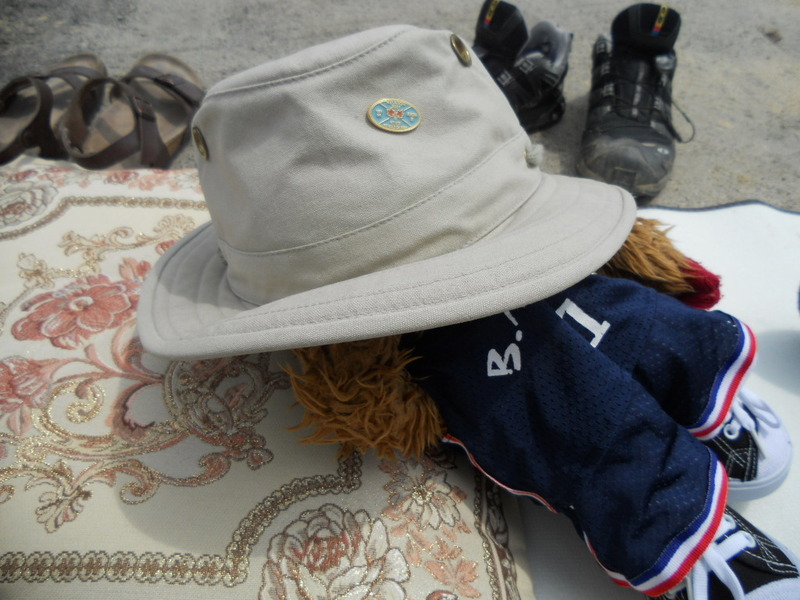 It is a bit far for Quatchone on the walk though. This town is full of festivals. There is the “Cotton Festival”, “Love festival” (never went to that one but it sounds interesting), “Rose festival”, “Sim Chong festival” and others. There are too many mention.We usually find out after the fact and sometimes it is nice not to see our students everyday. We basically live in the same neighbourhood as our students, meet their parents at the local stores, and their relatives too, and it is hard to be outside without someone calling our name.We do love them but sometimes it is nice to have a moment to ourselves. 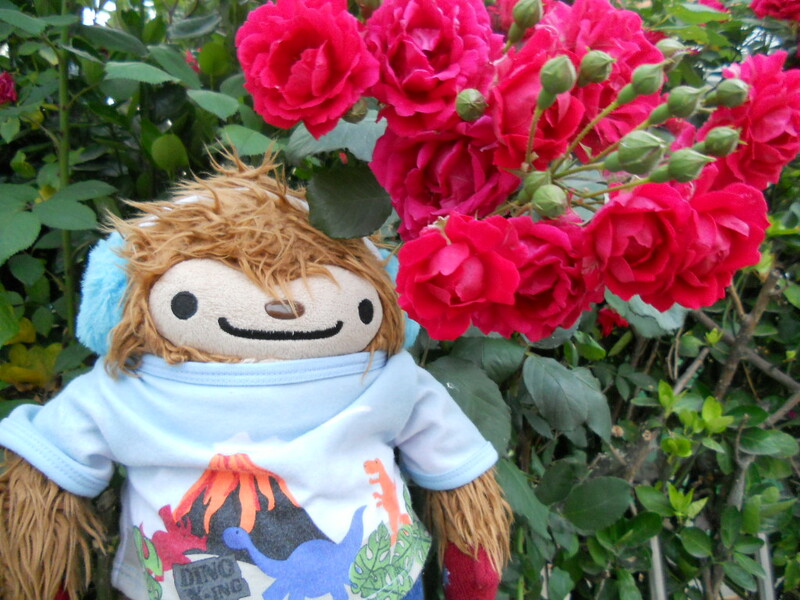 Here he is with some beautiful roses. 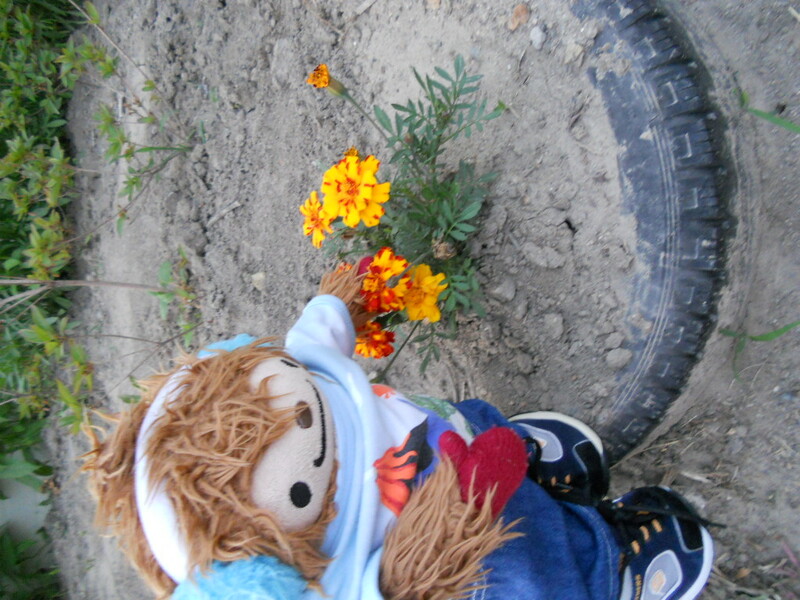 Quatchone loves the fact that the person recycled old tires as a planter. This is quite a popular food here. 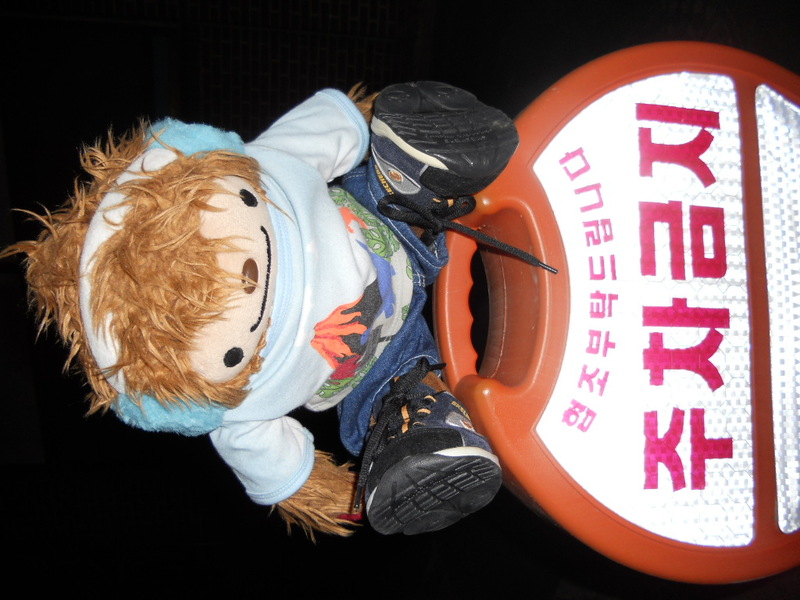 In fact the sign is part of a resturant that specializes only in intestine dishes. 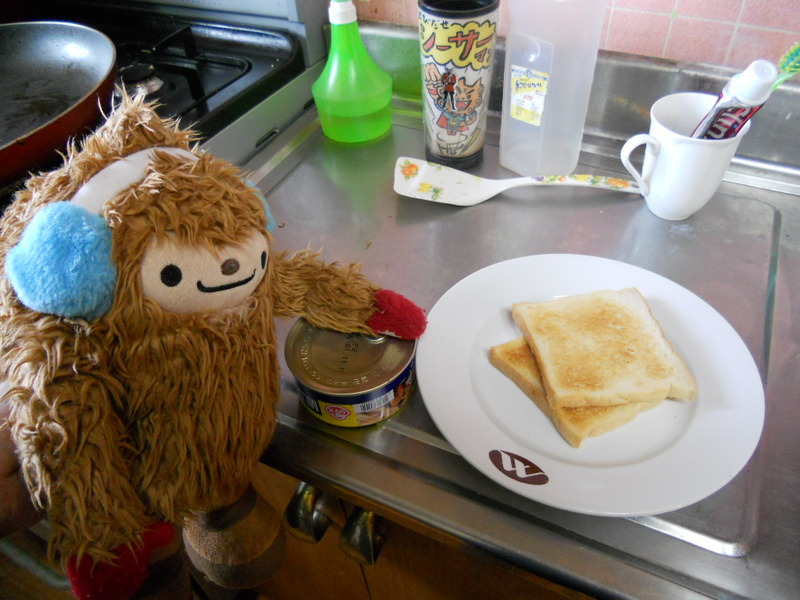 Even though it looks interesting, Quatchone doesn’t think that he is in a rush to have any of it. LOL. 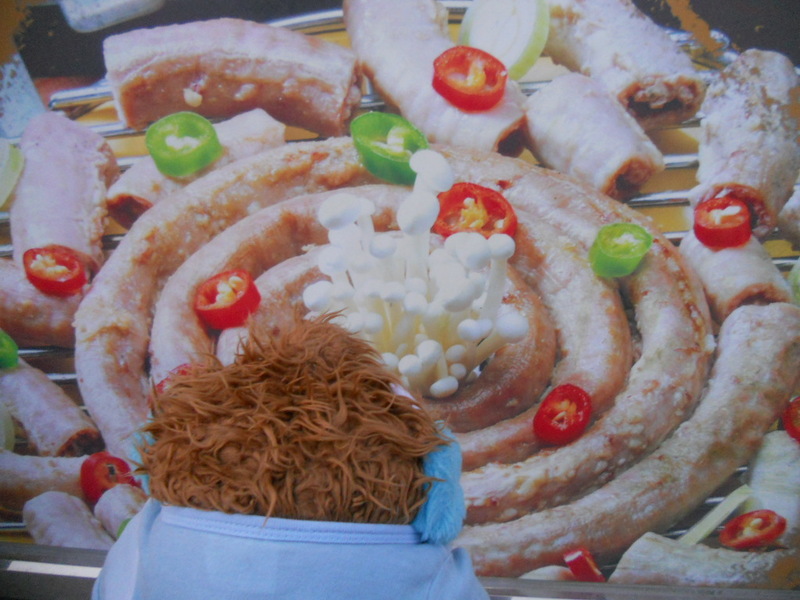 Here he is admiring some of the wonderful mural scenes with traditional Korean life depicted in them. That is for the first part of the walk. Sanctuary evening with the Quatchis. 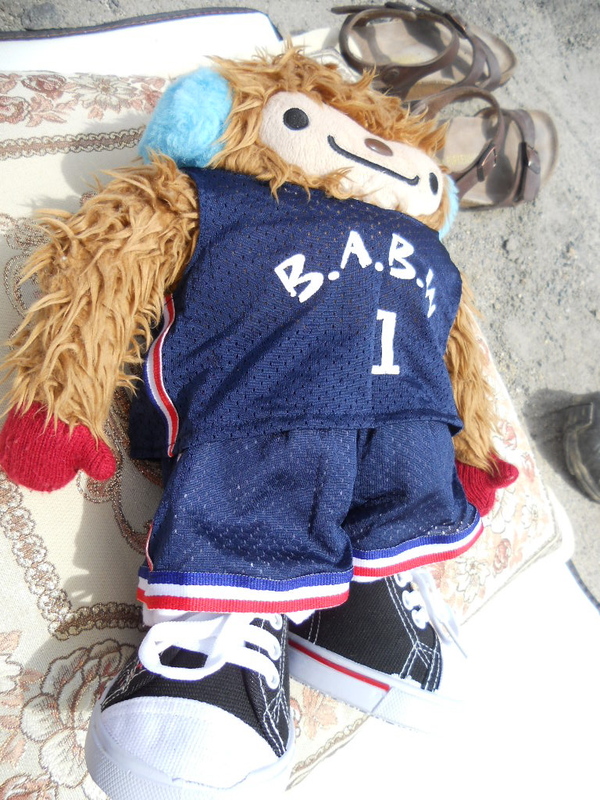 This is the new tv series that the Quatchi family has gotten into. Since they have the DVD for S.1 they have been watching it almost non-stop! 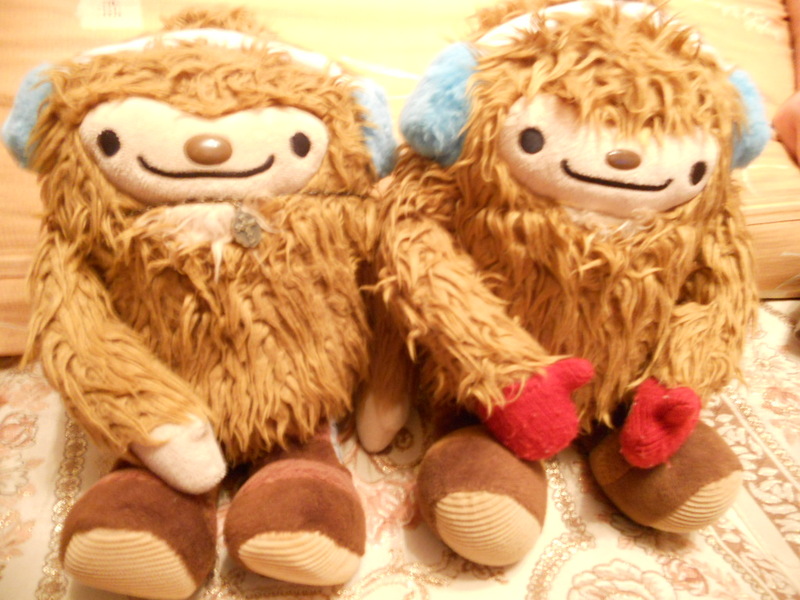 Here is Quatchella and Quatchone. 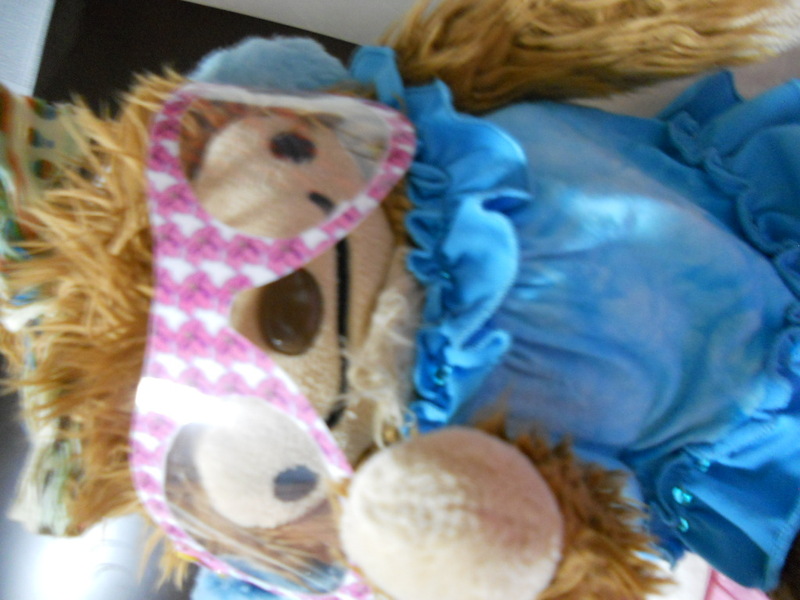 Quatchone said that she can hang on to him during the scary parts. 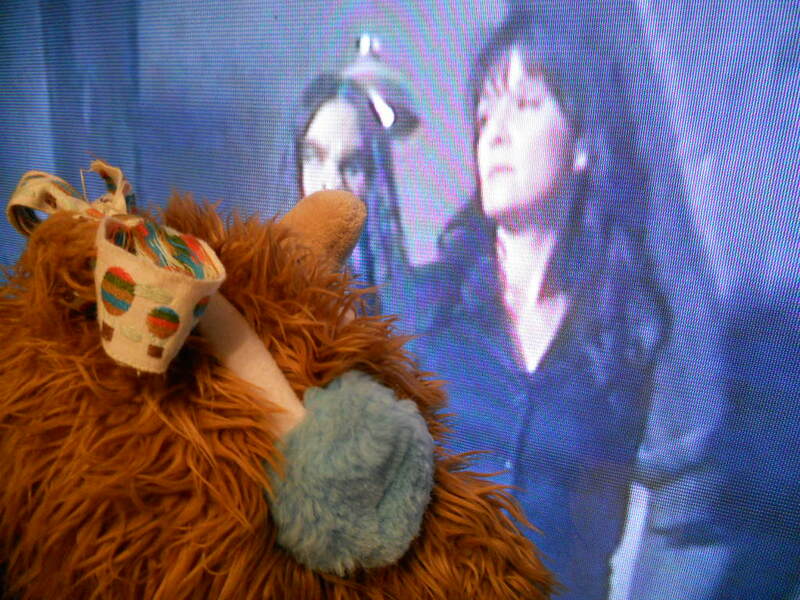 Quatchone likes watching Ashley Magnus. He thinks that she is hot! 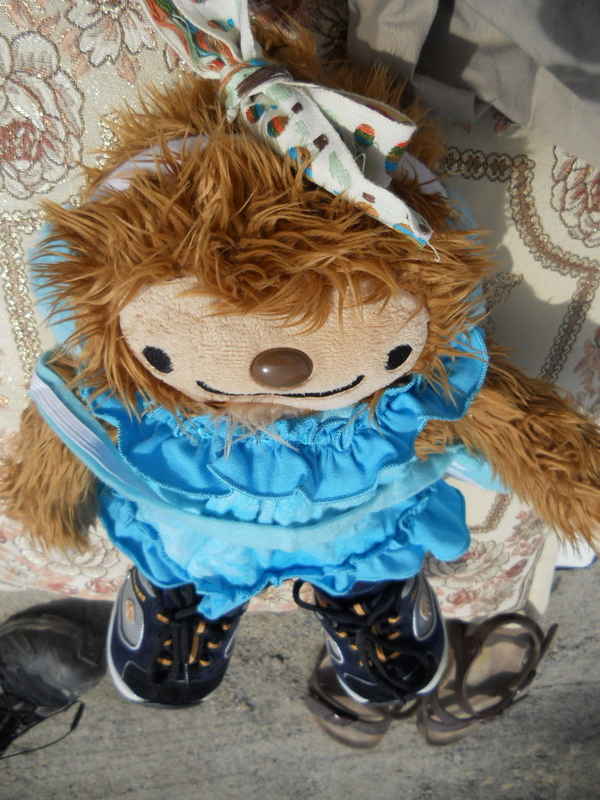 Quatchella is crushing on the Big Foot character even though she isn’t admitting it. LOL. But it is pretty obvious! 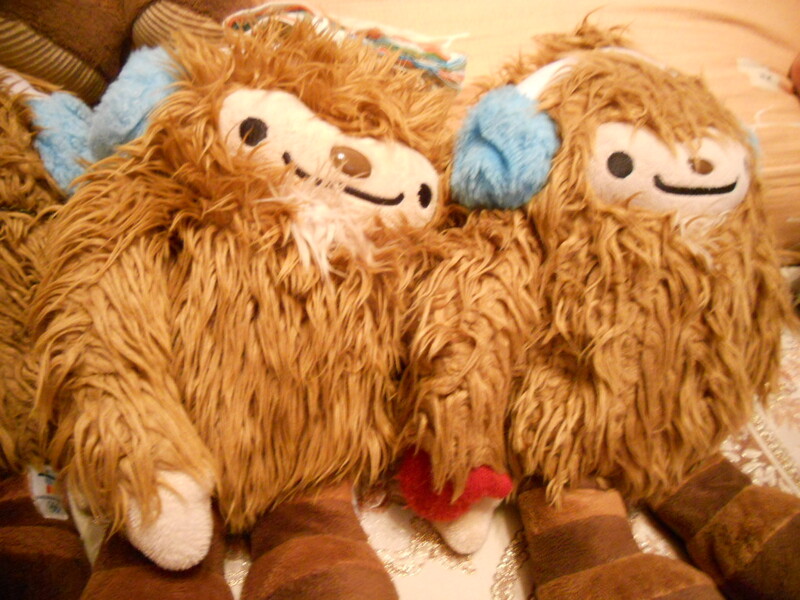 Quatchi and Quatchster like the stories and the Big Foot of course. 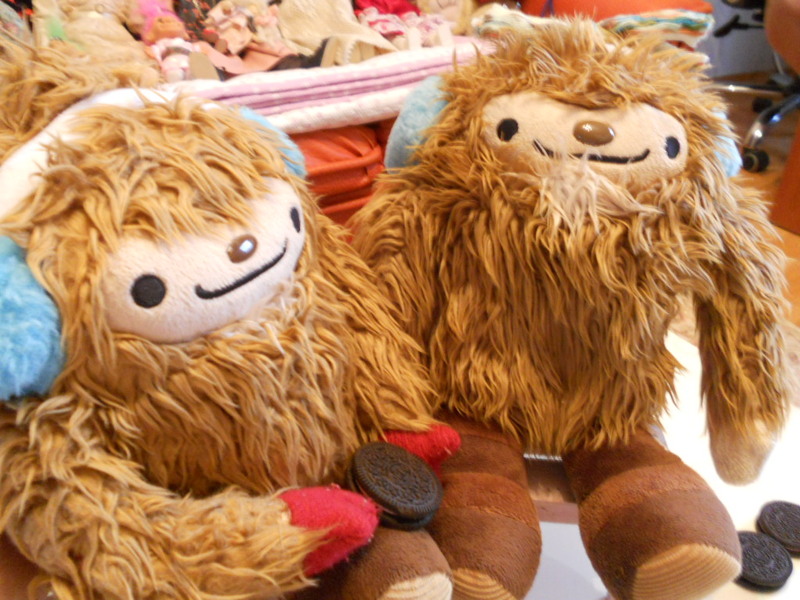 They are happy that he is such a cool representation of their kind. 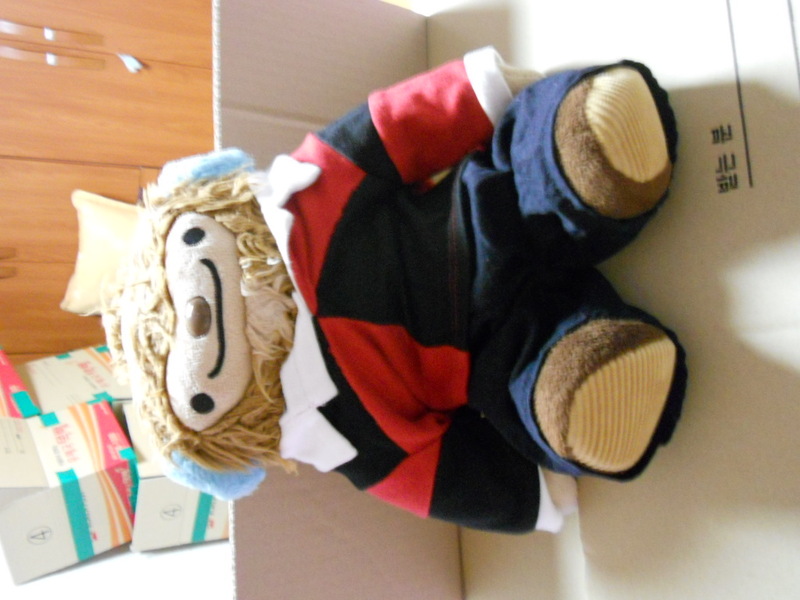 Here is a photo of Ashley Magnus. Quatchone really likes a strong, hot woman! 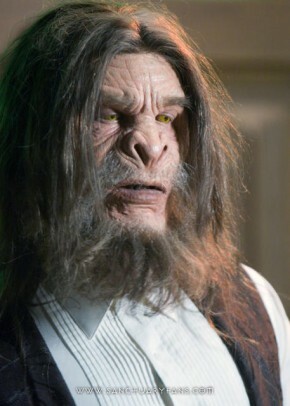 Here is the Big Foot guy that Quatchella is crushing on. She thinks he is very handsome and distinguished. 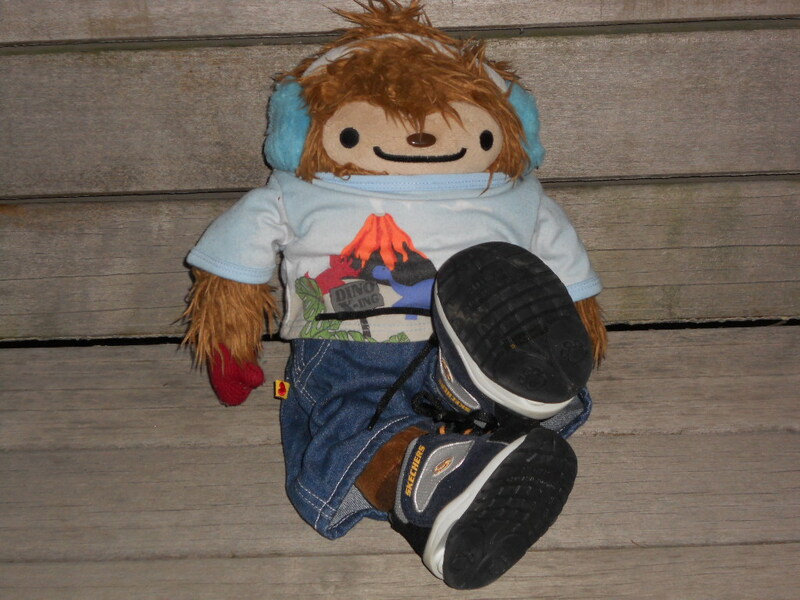 The other Quatchis have already seen the episode that these 4 are watching so they are relaxing on the balcony looking at the moon. If anyone has time, please check it out. It is awesome!